I don’t know how you spend your December, but part of it really ought to be done watching the Aardman Animation film Arthur Christmas . It inspired me to ponder a mathematical-physics question that got into some heady territory and this is a good time to point people back to that. The first piece is Could `Arthur Christmas’ Happen In Real Life? At one point in the movie Arthur and Grand-Santa are stranded on a Caribbean island while the reindeer and sleigh, without them, go flying off in a straight line. This raises the question of what is a straight line if you’re on the surface of something spherical like the Earth. Also, Grand-Santa is such a fantastic idea for the Santa canon it’s hard to believe that Rankin-Bass never did it. Returning To Arthur Christmas was titled that because I’d left the subject for a couple weeks. You know how it gets. Here the discussion becomes more spoiler-y. And it has to address the question of what kind of straight line the reindeer might move in. There’s several possible answers and they’re all interesting. Arthur Christmas And The Least Common Multiple supposes that reindeer move as way satellites do. By making some assumptions about the speed of the reindeer and the path they’re taking, I get to see how long Arthur and Grand-Santa would need to wait before the reindeer and sled are back if they’re lucky enough to be waiting on the equator. Six Minutes Off makes the problem of Arthur and Grand-Santa waiting for the return of flying reindeer more realistic. This involves supposing that they’re not on the equator, which makes meeting up the reindeer a much nastier bit of timing. If they get unlucky it could make their rescue take over five thousand years, which would complicate the movie’s plot some. And finally Arthur Christmas and the End of Time gets into one of those staggering thoughts. This would be recurrence, an idea that weaves into statistical mechanics and that seems to require that we accept how the conservation of energy and the fact of entropy are, together, a paradox. So we get into considerations of the long-term fate of the universe. Maybe. Today’s is one of the occasional essays in the Why Stuff Can Orbit sequence that just has a lot of equations. I’ve tried not to write everything around equations because I know what they’re like to read. They’re pretty to look at and after about four of them you might as well replace them with a big grey box that reads “just let your eyes glaze over and move down to the words”. It’s even more glaze-y than that for non-mathematicians. But we do need them. Equations are wonderfully compact, efficient ways to write about things that are true. Especially things that are only true if exacting conditions are met. They’re so good that I’ll often find myself checking a textbook for an explanation of something and looking only at the equations, letting my eyes glaze over the words. That’s a chilling thing to catch yourself doing. Especially when you’ve written some obscure textbooks and a slightly read mathematics blog. What I had been looking at was a perturbed central-force orbit. We have something, generically called a planet, that orbits the center of the universe. It’s attracted to the center of the universe by some potential energy, which we describe as ‘U(r)’. It’s some number that changes with the distance ‘r’ the planet has from the center of the universe. It usually depends on other stuff too, like some kind of mass of the planet or some constants or stuff. The planet has some angular momentum, which we can call ‘L’ and pretend is a simple number. It’s in truth a complicated number, but we’ve set up the problem where we can ignore the complicated stuff. This angular momentum implies the potential energy allows for a circular orbit at some distance which we’ll call ‘a’ from the center of the universe. From ‘U(r)’ and ‘L’ we can say whether this is a stable orbit. If it’s stable, a little perturbation, a nudging, from the circular orbit will stay small. If it’s unstable, a little perturbation will keep growing and never stop. If we perturb this circular orbit the planet will wobble back and forth around the circular orbit. Sometimes the radius will be a little smaller than ‘a’, and sometimes it’ll be a little larger than ‘a’. And now I want to see whether we get a stable closed orbit. The orbit will be closed if the planet ever comes back to the same position and same momentum that it started with. ‘Started’ is a weird idea in this case. But it’s common vocabulary. By it we mean “whatever properties the thing had when we started paying attention to it”. Usually in a problem like this we suppose there’s some measure of time. It’s typically given the name ‘t’ because we don’t want to make this hard on ourselves. The start is some convenient reference time, often ‘t = 0’. That choice usually makes the equations look simplest. The position of the planet we can describe with two variables. One is the distance from the center of the universe, ‘r’, which we know changes with time: ‘r(t)’. Another is the angle the planet makes with respect to some reference line. The angle we might call ‘θ’ and often do. This will also change in time, then, ‘θ(t)’. We can pick other variables to describe where something is. But they’re going to involve more algebra, more symbol work, than this choice does so who needs it? Momentum, now, that’s another set of variables we need to worry about. But we don’t need to worry about them. This particular problem is set up so that if we know the position of the planet we also have the momentum. We won’t be able to get both ‘r(t)’ and ‘θ(t)’ back to their starting values without also getting the momentum there. So we don’t have to worry about that. This won’t always work, as see my future series, ‘Why Statistical Mechanics Works’. Here ‘m’ is the mass of the planet. And ‘F’ is a useful little auxiliary function. It’s the force that the planet feels when it’s a distance from the origin. It’s defined as . It’s convenient to have around. It makes equations like this one simpler, for one. And it’s weird to think of a central force problem where we never, ever see forces. The peculiar thing is we define ‘F’ for every distance the planet might be from the center of the universe. But all we care about is its value at the equilibrium, circular orbit distance of ‘a’. We also care about its first derivative, also evaluated at the distance of ‘a’, which is that talk early on in that denominator. So in the time between time ‘0’ and time ‘Tr‘ the perturbed radius will complete a full loop. It’ll reach its biggest value and its smallest value and get back to the original. (It is so much easier to suppose the perturbation starts at its biggest value at time ‘0’ that we often assume it has. It doesn’t have to be. But if we don’t have something forcing the choice of what time to call ‘0’ on us, why not pick one that’s convenient?) The question is whether ‘θ(t)’ completes a full loop in that time. If it does then we’ve gotten back to the starting position exactly and we have a closed orbit. And ‘θ(Tr)’ will never equal ‘θ(0)’ again, not unless ‘ω’ is zero. And if ‘ω’ is zero then the planet is racing away from the center of the universe never to be seen again. Or it’s plummeting into the center of the universe to be gobbled up by whatever resides there. In either case, not what we traditionally think of as orbits. Even if we allow these as orbits, these would be nudges too big to call perturbations. So here’s the resolution. Angles are right awful pains in mathematical physics. This is because increasing an angle by 2π — or decreasing it by 2π — has no visible effect. In the language of the hew-mon, adding 360 degrees to a turn leaves you back where you started. A 45 degree angle is indistinguishable from a 405 degree angle, or a 765 degree angle, or a -315 degree angle, or so on. This makes for all sorts of irritating alternate cases to consider when you try solving for where one thing meets another. But it allows us to have closed orbits. Because we can have a closed orbit, now, if the radius ‘r(t)’ completes a full oscillation in the time it takes ‘θ(t)’ to grow by 2π. Or to grow by π. Or to grow by ½π. Or a third of π. Or so on. We might look stuck and at what seems like an even worse position. It’s not. When you do enough of these problems you get used to some tricks. For example, that ‘ma2‘ in the denominator we could move under the square root if we liked. This we know because at least as long as ‘ma2‘ is positive. It is. That’s getting nice and simple. Let me go complicate matters. I’ll want to know the angle that the planet sweeps out as the radius goes from its largest to its smallest value. Or vice-versa. This time is going to be half of ‘Tr‘, the time it takes to do a complete oscillation. The oscillation might have started at time ‘t’ of zero, maybe not. But how long it takes will be the same. I’m going to call this angle ‘ψ’, because I’ve written “the angle that the planet sweeps out as the radius goes from its largest to its smallest value” enough times this essay. If ‘ψ’ is equal to π, or one-half π, or one-third π, or some other nice rational multiple of π we’ll get a closed orbit. If it isn’t, we won’t. Put in the formulas we have for ‘Tr‘ and for ‘ω’. Now it’ll be complicated. Now we’ll make this a little simpler again. We have two square roots of fractions multiplied by each other. That’s the same as the square root of the two fractions multiplied by each other. So we can take numerator times numerator and denominator times denominator, all underneath the square root sign. See if I don’t. Oh yeah and one-half of two π is π but you saw that coming. OK, so there’s some minus signs in the numerator and denominator worth getting rid of. There’s an ‘m’ in the numerator and the denominator that we can divide out of both sides. There’s an ‘a’ in the denominator that can multiply into a term that has a denominator inside the denominator and you know this would be easier if I could use little cross-out symbols in WordPress LaTeX. If you’re not following all this, try writing it out by hand and seeing what makes sense to cancel out. This is getting not too bad. Start from a potential energy ‘U(r)’. Use an angular momentum ‘L’ to figure out the circular orbit radius ‘a’. From the potential energy find the force ‘F(r)’. And then, based on what ‘F’ and the first derivative of ‘F’ happen to be, at the radius ‘a’, we can see whether a closed orbit can be there. I’ve gotten to some pretty abstract territory here. Next time I hope to make things simpler again. Why Stuff Can Orbit, Part 12: How Fast Is An Orbit? On to the next piece of looking for stable, closed orbits of a central force. We start from a circular orbit of something around the sun or the mounting point or whatever. The center. I would have saved myself so much foggy writing if I had just decided to make this a sun-and-planet problem. But I had wanted to write the general problem. In this the force attracting the something towards the center has a strength that’s some constant times the distance to the center raised to a power. This is easy to describe in symbols. It’s cluttered to describe in words. This is why symbols are so nice. The perturbed orbit, the one I want to see close up, looks like an oscillation around that circle. The fact it is a perturbation, a small nudge away from the equilibrium, means how big the perturbation is will oscillate in time. How far the planet (whatever) is from the center will make a sine wave in time. Whether it closes depends on what it does in space. Part of what it does in space is easy. I just said what the distance from the planet to the center does. But to say where the planet is we need to know how far it is from the center and what angle it makes with respect to some reference direction. That’s a little harder. We also need to know where it is in the third dimension, but that’s so easy. An orbit like this is always in one plane, so we picked that plane to be that of our paper or whiteboard or tablet or whatever we’re using to sketch this out. That’s so easy to answer we don’t even count it as solved. The angle, though. Here, I mean the angle made by looking at the planet, the center, and some reference direction. This angle can be any real number, although a lot of those angles are going to point to the same direction in space. We’re coming at this from a mathematical view, or a physics view. Or a mathematical physics view. It means we measure this angle as radians instead of degrees. That is, a right angle is , not 90 degrees, thank you. A full circle is and not 360 degrees. We aren’t doing this to be difficult. There are good reasons to use radians. They make the mathematics simpler. What else could matter? We use as the symbol for this angle. It’s a popular choice. is going to change in time. We’ll want to know how fast it changes over time. This concept we call the angular velocity. For this there are a bunch of different possible notations. The one that I snuck in here two essays ago was ω. We came at the physics of this orbiting planet from a weird direction. Well, I came at it, and you followed along, and thank you for that. But I never did something like set the planet at a particular distance from the center of the universe and give it a set speed so it would have a circular enough orbit. I set up that we should have some potential energy. That energy implies a central force. It attracts things to the center of the universe. And that there should be some angular momentum that the planet has in its movement. And from that, that there would be some circular orbit. That circular orbit is one with just the right radius and just the right change in angle over time. From the potential energy and the angular momentum we can work out the radius of the circular orbit. Suppose your potential energy obeys a rule like for some number ‘C’ and some power, another number, ‘n’. Suppose your planet has the mass ‘m’. Then you’ll get a circular orbit when the planet’s a distance ‘a’ from the center, if . And it turns out we can also work out the angular velocity of this circular orbit. It’s all implicit in the amount of angular momentum that the planet has. This is part of why a mathematical physicist looks for concepts like angular momentum. They’re easy to work with, and they yield all sorts of interesting information, given the chance. I first introduced angular momentum as this number that was how much of something that our something had. It’s got physical meaning, though, reflecting how much … uh … our something would like to keep rotating around the way it has. And this can be written as a formula. The angular momentum ‘L’ is equal to the moment of inertia ‘I’ times the angular velocity ‘ω’. ‘L’ and ‘ω’ are really vectors, and ‘I’ is really a tensor. But we don’t have to worry about this because this kind of problem is easy. We can pretend these are all real numbers and nothing more. The moment of inertia depends on how the mass of the thing rotating is distributed in space. And it depends on how far the mass is from whatever axis it’s rotating around. For real bodies this can be challenging to work out. It’s almost always a multidimensional integral, haunting students in Calculus III. For a mass in a central force problem, though, it’s easy once again. Please tell me you’re not surprised. If it weren’t easy I’d have some more supplemental reading pieces here first. For a planet of mass ‘m’ that’s a distance ‘r’ from the axis of rotation, the moment of inertia ‘I’ is equal to ‘mr2‘. I’m fibbing. Slightly. This is for a point mass, that is, something that doesn’t occupy volume. We always look at point masses in this sort of physics. At least when we start. It’s easier, for one thing. And it’s not far off. The Earth’s orbit has a radius just under 150,000,000 kilometers. The difference between the Earth’s actual radius of just over 6,000 kilometers and a point-mass radius of 0 kilometers is a minor correction. We know that ‘r’ changes in time. It oscillates from a maximum to a minimum value like any decent sine wave. So ‘r2‘ is going to oscillate too, like a … sine-squared wave. And then dividing the constant ‘L’ by something oscillating like a sine-squared wave … this implies ω changes in time. So it does. In a possibly complicated and annoying way. So it does. I don’t want to deal with that. So I don’t. And this is going to be close enough. You may protest: what if it isn’t? Why can’t the perturbation be so big that ‘a’ is a lousy approximation to ‘r’? To this I say: if the perturbation is that big it’s not a perturbation anymore. It might be an interesting problem. But it’s a different problem from what I’m doing here. It needs different techniques. The Earth’s orbit is different from Halley’s Comet’s orbit in ways we can’t ignore. I hope this answers your complaint. Maybe it doesn’t. I’m on your side there. A lot of mathematical physics, and of analysis, is about making approximations. We need to find perturbations big enough to give interesting results. But not so big they need harder mathematics than you can do. It’s a strange art. I’m not sure I know how to describe how to do it. What I know I’ve learned from doing a lot of problems. You start to learn what kinds of approaches usually pan out. But what we’re relying on is the same trick we use in analysis. We suppose there is some error margin in the orbit’s radius and angle that’s tolerable. Then if the perturbation means we’d fall outside that error margin, we just look instead at a smaller perturbation. If there is no perturbation small enough to stay within our error margin then the orbit isn’t stable. And we already know it is. Here, we’re looking for closed orbits. People could in good faith argue about whether some particular observed orbit is a small enough perturbation from the circular equilibrium. But they can’t argue about whether there exist some small enough perturbations. Let me suppose that you’re all right with my answer about big perturbations. There’s at least one more good objection to have here. It’s this: where is the central force? The mass of the planet (or whatever) is there. The angular momentum is there. The equilibrium orbit is there. But where’s the force? Where’s the potential energy we started with? Shouldn’t that appear somewhere in the description of how fast this planet moves around the center? It should. And it is there, in an implicit form. We get the radius of the circular, equilibrium orbit, ‘a’, from knowing the potential energy. But we’ll do well to tease it out more explicitly. I hope to get there next time. Author Joseph NebusPosted on Thursday, 20 July, 2017 Thursday, 20 July, 2017 Categories Math, Mathematics, Maths, PhysicsTags central forces, classical mechanics, equilibriums, gravity, mechanics, orbits, perturbations, stability2 Comments on Why Stuff Can Orbit, Part 12: How Fast Is An Orbit? Art courtesy of Thomas K Dye, creator of the web comic Newshounds . He has a Patreon for those able to support his work. I’m not ready to finish the series off yet. But I am getting closer to wrapping up perturbed orbits. So I want to say something about what I’m looking for. In some ways I’m done already. I showed how to set up a central force problem, where some mass gets pulled towards the center of the universe. It can be pulled by a force that follows any rule you like. The rule has to follow some rules. The strength of the pull changes with how far the mass is from the center. It can’t depend on what angle the mass makes with respect to some reference meridian. Once we know how much angular momentum the mass has we can find whether it can have a circular orbit. And we can work out whether that orbit is stable. If the orbit is stable, then for a small nudge, the mass wobbles around that equilibrium circle. It spends some time closer to the center of the universe and some time farther away from it. I want something a little more, else I can’t carry on this series. I mean, we can make central force problems with more things in them. What we have now is a two-body problem. A three-body problem is more interesting. It’s pretty near impossible to give exact, generally true answers about. We can save things by only looking at very specific cases. Fortunately one is a sun, planet, and moon, where each object is much more massive than the next one. We see a lot of things like that. Four bodies is even more impossible. Things start to clear up if we look at, like, a million bodies, because our idea of what “clear” is changes. I don’t want to do that right now. Instead I’m going to look for closed orbits. Closed orbits are what normal people would call “orbits”. We’re used to thinking of orbits as, like, satellites going around and around the Earth. We know those go in circles, or ellipses, over and over again. They don’t, but the difference between a closed orbit and what they do is small enough we don’t need to care. Here, “orbit” means something very close to but not exactly what normal people mean by orbits. Maybe I should have said something about that before. But the difference hasn’t counted for much before. Now imagine knowing all the sets of positions and momentums that the mass has had. Don’t look just at the reference time. Look at all the time before the reference time, and look at all the time after the reference time. Imagine highlighting all the sets of positions and momentums the mass ever took on or ever takes on. We highlight them against the universe of all the positions and momentums that the mass could have had if this were a different problem. What we get is this ribbon-y thread that passes through the universe of every possible setup. This universe of every possible setup we call a “phase space”. It’s easy to explain the “space” part of that name. The phase space obeys the rules we’d expect from a vector space. It also acts in a lot of ways like the regular old space that we live in. The “phase” part I’m less sure how to justify. I suspect we get it because this way of looking at physics problems comes from statistical mechanics. And in that field we’re looking, often, at the different ways a system can behave. This mathematics looks a lot like that of different phases of matter. The changes between solids and liquids and gases are some of what we developed this kind of mathematics to understand, in fact. But this is speculation on my part. I’m not sure why “phase” has attached to this name. I can think of other, harder-to-popularize reasons why the name would make sense too. Maybe it’s the convergence of several reasons. I’d love to hear if someone has a good etymology. If one exists; remember that we still haven’t got the story straight about why ‘m’ stands for the slope of a line. Anyway, this ribbon of all the arrangements of position and momentum that the mass does ever at any point have we call a “trajectory”. We call it a trajectory because it looks like a trajectory. Sometimes mathematics terms aren’t so complicated. We also call it an “orbit” since very often the problems we like involve trajectories that loop around some interesting area. It looks like a planet orbiting a sun. A “closed orbit” is an orbit that gets back to where it started. This means you can take some reference time, and wait. Eventually the mass comes back to the same position and the same momentum that you saw at that reference time. This might seem unavoidable. Wouldn’t it have to get back there? And it turns out, no, it doesn’t. A trajectory might wander all over phase space. This doesn’t take much imagination. But even if it doesn’t, if it stays within a bounded region, it could still wander forever without repeating itself. If you’re not sure about that, please consider an old sequence I wrote inspired by the Aardman Animation film Arthur Christmas . Also please consider seeing the Aardman Animation film Arthur Christmas . It is one of the best things this decade has offered us. The short version is, though, that there is a lot of room even in the smallest bit of space. A trajectory is, in a way, a one-dimensional thing that might get all coiled up. But phase space has got plenty of room for that. And sometimes we will get a closed orbit. The mass can wander around the center of the universe and come back to wherever we first noticed it with the same momentum it first had. A that point it’s locked into doing that same thing again, forever. If it could ever break out of the closed orbit it would have had to the first time around, after all. Closed orbits, I admit, don’t exist in the real world. Well, the real world is complicated. It has more than a single mass and a single force at work. Energy and momentum are conserved. But we effectively lose both to friction. We call the shortage “entropy”. Never mind. No person has ever seen a circle, and no person ever will. They are still useful things to study. So it is with closed orbits. An equilibrium orbit, the circular orbit of a mass that’s at exactly the right radius for its angular momentum, is closed. A perturbed orbit, wobbling around the equilibrium, might be closed. It might not. I mean next time to discuss what has to be true to close an orbit. Art courtesy of Thomas K Dye, creator of the web comic Newshounds . He has a Patron for those able to support his work. 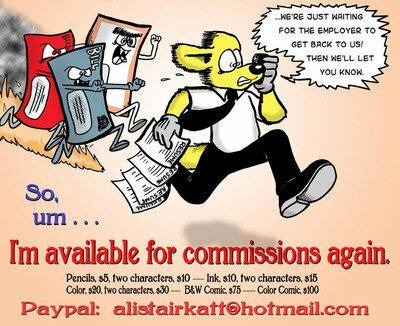 And again my thanks to Thomas K Dye, creator of the web comic Newshounds , for the banner art. He has a Patreon to support his creative habit. In the last installment I introduced perturbations. These are orbits that are a little off from the circles that make equilibriums. And they introduce something that’s been lurking, unnoticed, in all the work done before. That’s time. See, how do we know time exists? … Well, we feel it, so, it’s hard for us not to notice time exists. Let me rephrase it then, and put it in contemporary technology terms. Suppose you’re looking at an animated GIF. How do you know it’s started animating? Or that it hasn’t stalled out on some frame? If the picture changes, then you know. It has to be going. But if it doesn’t change? … Maybe it’s stalled out. Maybe it hasn’t. You don’t know. You know there’s time when you can see change. And that’s one of the little practical insights of physics. You can build an understanding of special relativity by thinking hard about that. Also think about the observation that the speed of light (in vacuum) doesn’t change. When something physical’s in equilibrium, it isn’t changing. That’s how we found equilibriums to start with. And that means we stop keeping track of time. It’s one more thing to keep track of that doesn’t tell us anything new. Who needs it? For the planet orbiting a sun, in a perfect circle, or its other little variations, we do still need time. At least some. How far the planet is from the sun doesn’t change, no, but where it is on the orbit will change. We can track where it is by setting some reference point. Where the planet is at the start of our problem. How big is the angle between where the planet is now, the sun (the center of our problem’s universe), and that origin point? That will change over time. But it’ll change in a boring way. The angle will keep increasing in magnitude at a constant speed. Suppose it takes five time units for the angle to grow from zero degrees to ten degrees. Then it’ll take ten time units for the angle to grow from zero to twenty degrees. It’ll take twenty time units for the angle to grow from zero to forty degrees. Nice to know if you want to know when the planet is going to be at a particular spot, and how long it’ll take to get back to the same spot. At this rate it’ll be eighteen time units before the angle grows to 360 degrees, which looks the same as zero degrees. But it’s not anything interesting happening. We’ll label this sort of change, where time passes, yeah, but it’s too dull to notice as a “dynamic equilibrium”. There’s change, but it’s so steady and predictable it’s not all that exciting. And I’d set up the circular orbits so that we didn’t even have to notice it. If the radius of the planet’s orbit doesn’t change, then the rate at which its apsidal angle changes, its “angular velocity”, also doesn’t change. Now, with perturbations, the distance between the planet and the center of the universe will change in time. That was the stuff at the end of the last installment. But also the apsidal angle is going to change. I’ve used ‘r(t)’ to represent the radial distance between the planet and the sun before, and to note that what value it is depends on the time. I need some more symbols. There’s two popular symbols to use for angles. Both are Greek letters because, I dunno, they’ve always been. (Florian Cajori’s A History of Mathematical Notation doesn’t seem to have anything. And when my default go-to for explaining mathematician’s choices tells me nothing, what can I do? Look at Wikipedia? Sure, but that doesn’t enlighten me either.) One is to use theta, θ. The other is to use phi, φ. Both are good, popular choices, and in three-dimensional problems we’ll often need both. We don’t need both. The orbit of something moving under a central force might be complicated, but it’s going to be in a single plane of movement. The conservation of angular momentum gives us that. It’s not the last thing angular momentum will give us. The orbit might happen not to be in a horizontal plane. But that’s all right. We can tilt our heads until it is. So I’ll reach deep into the universe of symbols for angles and call on θ for the apsidal angle. θ will change with time, so, ‘θ(t)’ is the angular counterpart to ‘r(t)’. I’d said before the apsidal angle is the angle made between the planet, the center of the universe, and some reference point. What is my reference point? I dunno. It’s wherever θ(0) is, that is, where the planet is when my time ‘t’ is zero. There’s probably a bootstrapping fallacy here. I’ll cover it up by saying, you know, the reference point doesn’t matter. It’s like the choice of prime meridian. We have to have one, but we can pick whatever one is convenient. So why not pick one that gives us the nice little identity that ‘θ(0) = 0’? If you don’t buy that and insist I pick a reference point first, fine, go ahead. But you know what? The labels on my time axis are arbitrary. There’s no difference in the way physics works whether ‘t’ is ‘0’ or ‘2017’ or ‘21350’. (At least as long as I adjust any time-dependent forces, which there aren’t here.) So we get back to ‘θ(0) = 0’. Here ‘a’ is the radius of the circular orbit. And ω is a constant number, the angular velocity. It’s how much a bit of time changes the apsidal angle. And this set of equations is pretty dull. You can see why it barely rates a mention. Here ‘A’ and ‘B’ are some numbers telling us how big the perturbation is, and ‘m’ is the mass of the planet, and ‘k’ is something related to how strong the central force is. And ‘a’ is that radius of the circular orbit, the thing we’re perturbed around. What about ‘θ(t)’? How’s that look? … We don’t seem to have a lot to go on. We could go back to Newton and all that force equalling the change in momentum over time stuff. We can always do that. It’s tedious, though. We have something better. It’s another gift from the conservation of angular momentum. When we can turn a forces-over-time problem into a conservation-of-something problem we’re usually doing the right thing. The conservation-of-something is typically a lot easier to set up and to track. We’ve used it in the conservation of energy, before, and we’ll use it again. The conservation of ordinary, ‘linear’, momentum helps other problems, though not I’ll grant this one. The conservation of angular momentum will help us here. The linear momentum of a thing is its inertia times its velocity. This is if the thing isn’t moving fast enough we have to notice relativity. Also if it isn’t, like, an electric or a magnetic field so we have to notice it’s not precisely a thing. Also if it isn’t a massless particle like a photon because see previous sentence. I’m talking about ordinary things like planets and blocks of wood on springs and stuff. The inertia, ‘m’, is rather happily the same thing as its mass. The velocity is how fast something is travelling and which direction it’s going in. Here, again, talking about stuff that isn’t moving so fast we have to notice relativity. That isn’t electric or magnetic fields. That isn’t massless particles. And so on. Here ‘I’ is the “moment of inertia” and is the angular velocity. The angular velocity is a vector that describes for us how fast the spinning is and what direction the axis around which the thing spins is. The moment of inertia describes how easy or hard it is to make the thing spin around each axis. It’s a tensor because real stuff can be easier to spin in some directions than in others. If you’re not sure that’s actually so, try tossing some stuff in the air so it spins in each of the three major directions. You’ll see. The mass ‘m’ doesn’t change. We’re not doing those kinds of problem. So however ‘r’ changes in time, the angular velocity ‘ω’ has to change with it, so that this product stays constant. The angular velocity is how the apsidal angle ‘θ’ changes over time. So since we know ‘L’ doesn’t change, and ‘m’ doesn’t change, then the way ‘r’ changes must tell us something about how ‘θ’ changes. We’ll get into that next time. First, I thank Thomas K Dye for the banner art I have for this feature! Thomas is the creator of the longrunning web comic Newshounds . He’s hoping soon to finish up special editions of some of the strip’s stories and to publish a definitive edition of the comic’s history. He’s also got a Patreon account to support his art habit. Please give his creations some of your time and attention. Now back to central forces. I’ve run out of obvious fun stuff to say about a mass that’s in a circular orbit around the center of the universe. Before you question my sense of fun, remember that I own multiple pop histories about the containerized cargo industry and last month I read another one that’s changed my mind about some things. These sorts of problems cover a lot of stuff. They cover planets orbiting a sun and blocks of wood connected to springs. That’s about all we do in high school physics anyway. Well, there’s spheres colliding, but there’s no making a central force problem out of those. You can also make some things that look like bad quantum mechanics models out of that. The mathematics is interesting even if the results don’t match anything in the real world. But I’m sticking with central forces that look like powers. These have potential energy functions with rules that look like V(r) = C rn. So far, ‘n’ can be any real number. It turns out ‘n’ has to be larger than -2 for a circular orbit to be stable, but that’s all right. There are lots of numbers larger than -2. ‘n’ carries the connotation of being an integer, a whole (positive or negative) number. But if we want to let it be any old real number like 0.1 or π or 18 and three-sevenths that’s fine. We make a note of that fact and remember it right up to the point we stop pretending to care about non-integer powers. I estimate that’s like two entries off. What I’d like to talk about is if we’re not quite at that radius. If we set the planet (or whatever) a little bit farther from the center of the universe. Or a little closer. Same angular momentum though, so the equilibrium, the circular orbit, should be in the same spot. It happens there isn’t a planet there. This enters us into the world of perturbations, which is where most of the big money in mathematical physics is. 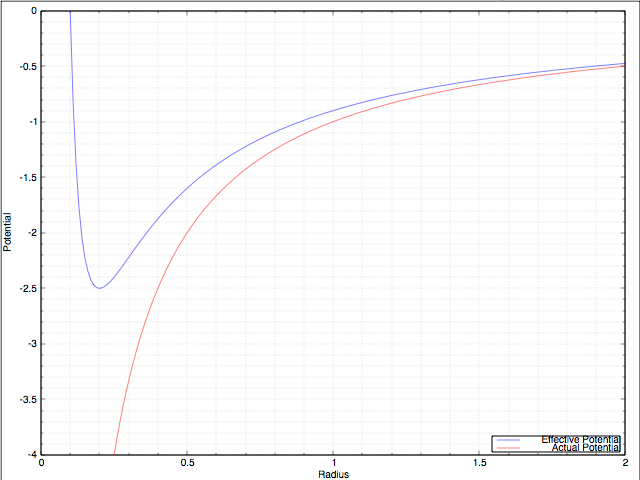 A perturbation is a little nudge away from an equilibrium. What happens in response to the little nudge is interesting stuff. And here we already know, qualitatively, what’s going to happen: the planet is going to rock around the equilibrium. This is because the circular orbit is a stable equilibrium. I’d described that qualitatively last time. So now I want to talk quantitatively about how the perturbation changes given time. The there means “defined to be equal to”. You might ask how this is different from “equals”. It seems like more emphasis to me. Also, there are other names for the circular orbit’s radius that I could have used. ‘re‘ would be good enough, as the subscript would suggest “radius of equilibrium”. Or ‘r0‘ would be another popular choice, the 0 suggesting that this is something of key, central importance and also looking kind of like a circle. (That’s probably coincidence.) I like the ‘a’ better there because I know how easy it is to drop a subscript. If you’re working on a problem for yourself that’s easy to fix, with enough cursing and redoing your notes. On a board in front of class it’s even easier to fix since someone will ask about the lost subscript within three lines. In a post like this? It would be a mess. The “approximate” there is because this is an approximation. is in truth equal to the thing on the right-hand-side there plus something that isn’t (usually) zero, but that is small. I am sorry beyond my ability to describe that I didn’t make that ‘m’ and ‘m2‘ consistent last week. That’s all right. One of these is going to disappear right away. Now, what is? Well, that’s whatever you get from putting in ‘a’ wherever you start out seeing ‘r’ in the expression for . I’m not going to bother with that. Call it math, fine, but that’s just a search-and-replace on the character ‘r’. Also, where I’m going next, it’s going to disappear, never to be seen again, so who cares? What’s important is that this is a constant number. If ‘r’ changes, the value of does not, because ‘r’ doesn’t appear anywhere in . How about ‘m’? That’s the value of the first derivative of ‘Veff‘ with respect to ‘r’, evaluated when ‘r’ is equal to ‘a’. That might be something. It’s not, because of what ‘a’ is. It’s the value of ‘r’ which would make equal to zero. That’s why ‘a’ has that value instead of some other, any other. So we’ll have a constant part ‘Veff(a)’, plus a zero part, plus a part that’s a parabola. This is normal, by the way, when we do expansions around an equilibrium. At least it’s common. Good to see it. To find ‘m2‘ we have to take the second derivative of ‘Veff(r)’ and then evaluate it when ‘r’ is equal to ‘a’ and ugh but here it is. We know exactly what ‘a’ is so we could write that out in a nice big expression. You don’t want to. I don’t want to. It’s a bit of a mess. I mean, it’s not hard, but it has a lot of symbols in it and oh all right. Here. Look fast because I’m going to get rid of that as soon as I can. For the values of ‘n’ that we actually care about because they turn up in real actual physics problems this expression simplifies some. Enough, anyway. If we pretend we know nothing about ‘n’ besides that it is a number bigger than -2 then … ugh. We don’t have a lot that can clean it up. We get away with this because we happen to know that ‘F(a)’ is equal to and doesn’t that work out great? We’ve turned a symbolic mess into a … less symbolic mess. Now why do I say it’s legitimate to introduce ‘F(r)’ here? It’s because minus the derivative of the potential energy with respect to the position of something can be something of actual physical interest. It’s the amount of force exerted on the particle by that potential energy at that point. The amount of force on a thing is something that we could imagine being interested in. Indeed, we’d have used that except potential energy is usually so much easier to work with. I’ve avoided it up to this point because it wasn’t giving me anything I needed. Here, I embrace it because it will save me from some awful lines of symbols. Here, ‘p’ is the (linear) momentum of whatever’s orbiting, which we can treat as equal to ‘mr’, the mass of the orbiting thing times how far it is from the center. You may sense in me some reluctance about doing this, what with that ‘we can treat as equal to’ talk. There’s reasons for this and I’d have to get deep into geometry to explain why. I can get away with specifically this use because the problem allows it. If you’re trying to do your own original physics problem inspired by this thread, and it’s not orbits like this, be warned. This is a spot that could open up to a gigantic danger pit, lined at the bottom with sharp spikes and angry poison-clawed mathematical tigers and I bet it’s raining down there too. This tells us something about what the orbit of a thing not in a circular orbit will be like. Yes, I see you in the back there, quivering with excitement about how we’ve got to elliptical orbits. You’re moving too fast. We haven’t got that. There will be elliptical orbits, yes, but only for a very particular power ‘n’ for the potential energy. Not for most of them. We’ll see. It might strike you there’s something in that square root. We need to take the square root of a positive number, so maybe this will tell us something about what kinds of powers we’re allowed. It’s a good thought. It turns out not to tell us anything useful, though. Suppose we started with . Then , and . Sad to say, this leads us to a journey which reveals that we need ‘n’ to be larger than -2 or else we don’t get oscillations around a circular orbit. We already knew that, though. We already found we needed it to have a stable equilibrium before. We can see there not being a period for these oscillations around the circular orbit as another expression of the circular orbit not being stable. Sad to say, we haven’t got something new out of this. We will get to new stuff, though. Maybe even ellipses. I bet you imagined I’d forgot this series, or that I’d quietly dropped it. Not so. I’ve just been finding the energy for this again. 2017 has been an exhausting year. With the last essay I finished the basic goal of “Why Stuff Can Orbit”. I’d described some of the basic stuff for central forces. These involve something — a planet, a mass on a spring, whatever — being pulled by the … center. Well, you can call anything the origin, the center of your coordinate system. Why put that anywhere but the place everything’s pulled towards? The key thing about a central force is it’s always in the direction of the center. It can be towards the center or away from the center, but it’s always going to be towards the center because the “away from” case is boring. (The thing gets pushed away from the center and goes far off, never to be seen again.) How strongly it’s pulled toward the center changes only with the distance from the center. Since the force only changes with the distance between the thing and the center it’s easy to think this is a one-dimensional sort of problem. You only need the coordinate describing this distance. We call that ‘r’, because we end up finding orbits that are circles. Since the distance between the center of a circle and its edge is the radius, it would be a shame to use any other letter. Forces are hard to work with. At least for a lot of stuff. We can represent central forces instead as potential energy. This is easier because potential energy doesn’t have any direction. It’s a lone number. When we can shift something complicated into one number chances are we’re doing well. But we are describing something in space. Something in three-dimensional space, although it turns out we’ll only need two. We don’t care about stuff that plunges right into the center; that’s boring. We like stuff that loops around and around the center. Circular orbits. We’ve seen that second dimension in the angular momentum, which we represent as ‘L’ for reasons I dunno. I don’t think I’ve ever met anyone who did. Maybe it was the first letter that came to mind when someone influential wrote a good textbook. Angular momentum is a vector, but for these problems we don’t need to care about that. We can use an ordinary number to carry all the information we need about it. We get that information from the potential energy plus a term that’s based on the square of the angular momentum divided by the square of the radius. This “effective potential energy” lets us find whether there can be a circular orbit at all, and where it’ll be. And it lets us get some other nice stuff like how the size of the orbit and the time it takes to complete an orbit relate to each other. See the earlier stuff for details. In short, though, we get an equilibrium, a circular orbit, whenever the effective potential energy is flat, neither rising nor falling. That happens when the effective potential energy changes from rising to falling, or changes from falling to rising. Well, if it isn’t rising and if it isn’t falling, what else can it be doing? It only does this for an infinitesimal moment, but that’s all we need. It also happens when the effective potential energy is flat for a while, but that like never happens. Where I want to go next is into closed orbits. That is, as the planet orbits a sun (or whatever it is goes around whatever it’s going around), does it come back around to exactly where it started? Moving with the same speed in the same direction? That is, does the thing orbit like a planet does? To get there I’ll have to put back a second dimension. Sorry. Won’t need a third, though. That’ll get named θ because that’s our first choice for an angle. And it makes too much sense to describe a planet’s position as its distance from the center and the angle it makes with respect to some reference line. Which reference line? Whatever works for you. It’s like measuring longitude. We could measure degrees east and west of some point other than Greenwich as well, and as correctly, as we do. We use the one we use because it was convenient. One of the ways we can study this is by looking at the effective potential energy. By its shape we can say whether a central-force equilibrium is stable or not. It’s easy, too, as we’ve got this set up. (Warning before you go passing yourself off as a mathematical physicist: it is not always easy!) Look at the effective potential energy versus the radius. If it has a part that looks like a bowl, cupped upward, it’s got a stable equilibrium. 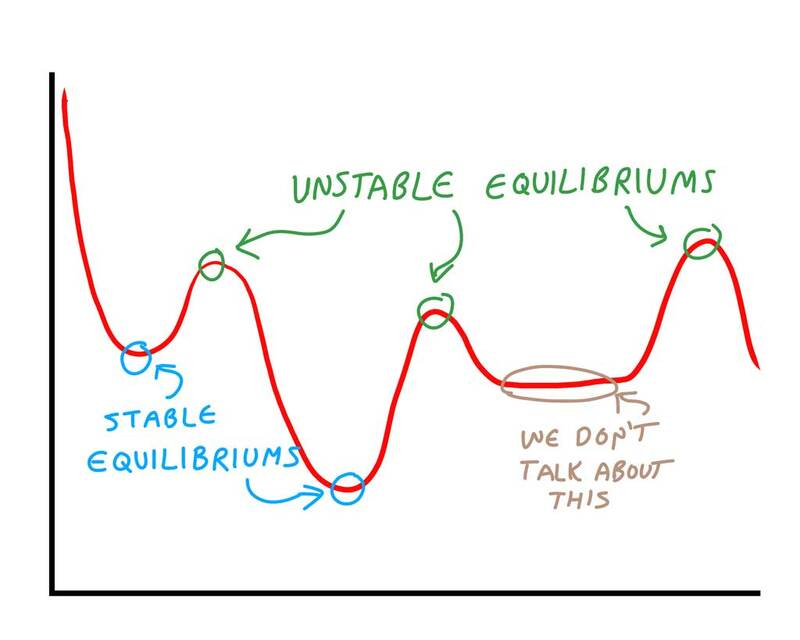 If it doesn’t, it doesn’t have a stable equilibrium. If you aren’t sure, imagine the potential energy was a track, like for a toy car. And imagine you dropped a marble on it. If you give the marble a nudge, does it roll to a stop? If it does, stable. If it doesn’t, unstable. A phony effective potential energy. Most are a lot less exciting than this; see some of the earlier pieces in this series. But some weird-shaped functions like this were toyed with by physicists in the 19th century who were hoping to understand chemistry. Why should gases behave differently at different temperatures? Why should some combinations of elements make new compounds while others don’t? We needed statistical mechanics and quantum mechanics to explain those, but we couldn’t get there without a lot of attempts and failures at explaining it with potential energies and classical mechanics. Stable is more interesting. We look at cases where there is this little bowl cupped upward. If we have a tiny nudge we only have to look at a small part of that cup. And that cup is going to look an awful lot like a parabola. If you don’t remember what a parabola is, think back to algebra class. Remember that curvey shape that was the only thing drawn on the board when you were dealing with the quadratic formula? That shape is a parabola. Who cares about parabolas? We care because we know something good about them. In this context, anyway. The potential energy for a mass on a spring is also a parabola. And we know everything there is to know about masses on springs. Seriously. You’d think it was all physics was about from like 1678 through 1859. That’s because it’s something calculus lets us solve exactly. We don’t need books of complicated integrals or computers to do the work for us. So here’s what we do. It’s something I did not get clearly when I was first introduced to these concepts. This left me badly confused and feeling lost in my first physics and differential equations courses. We are taking our original physics problem and building a new problem based on it. This new problem looks at how big our nudge away from the equilibrium is. How big the nudge is, how fast it grows, how it changes in time will follow rules. Those rules will look a lot like those for a mass on a spring. We started out with a radius that gives us a perfectly circular orbit. Now we get a secondary problem about how the difference between the nudged and the circular orbit changes in time. That secondary problem has the same shape, the same equations, as a mass on a spring does. A mass on a spring is a central force problem. All the tools we had for studying central-force problems are still available. There is a new central-force problem, hidden within our original one. Here the “center” is the equilibrium we’re nudged around. It will let us answer a new set of questions. Last time around I showed how to do a central-force problem for normal gravity. That’s one where a planet, or moon, or satellite, or whatever is drawn towards the center of space. It’s drawn by a potential energy that equals some constant times the inverse of the distance from the origin. That is, V(r) = C r-1. With a little bit of fussing around we could find out what distance from the center lets a circular orbit happen. And even Kepler’s Third Law, connecting how long an orbit takes to how big it must be. There are two natural follow-up essays. One is to work out elliptical orbits. We know there are such things; all real planets and moons have them, and nearly all satellites do. The other is to work out circular orbits for another easy-to-understand example, like a mass on a spring. That’s something with a potential energy that looks like V(r) = C r2. I want to do the elliptical orbits later on. The mass-on-a-spring I could do now. So could you, if you look follow last week’s essay and just change the numbers a little. But, you know, why bother working out one problem? Why not work out a lot of them? Why not work out every central-force problem, all at once? Because we can’t. I mean, I can describe how to do that, but it isn’t going to save us much time. Like, the quadratic formula is great because it’ll give you the roots of a quadratic polynomial in one step. You don’t have to do anything but a little arithmetic. We can’t get a formula that easy if we try to solve for every possible potential energy. Here ‘C’ is some number. It might depend on the planet’s mass, or the sun’s mass. Doesn’t matter. All that’s important is that it not change over the course of the problem. So, ‘C’ for Constant. And ‘n’ is another constant number. Some numbers turn up a lot in useful problems. If ‘n’ is -1 then this can describe gravitational attraction. If ‘n’ is 2 then this can describe a mass on a spring. This ‘n’ can be any real number. That’s not an ideal choice of letter. ‘n’ usually designates a whole number. By using that letter I’m biasing people to think of numbers like ‘2’ at the expense of perfectly legitimate alternatives such as ‘2.1’. But now that I’ve made that explicit maybe we won’t make a casual mistake. So what I want is to find where there are stable circular orbits for an arbitrary radius-to-a-power force. I don’t know what ‘C’ and ‘n’ are, but they’re some numbers. To find where a planet can have a circular orbit I need to suppose the planet has some mass, ‘m’. And that its orbit has some angular momentum, a number called ‘L’. From this we get the effective potential energy. That’s what the potential energy looks like when we remember that angular momentum has to be conserved. That derivative we know from the rules of how to take derivatives. And from this point on we have to do arithmetic. We want to get something which looks like ‘r = (some mathematics stuff here)’. Hopefully it’ll be something not too complicated. And hey, in the second term there, the one with L2 in it, we have a 2 in the numerator and a 2 in the denominator. So those cancel out and that’s simpler. That’s hopeful, isn’t it? OK. Add to both sides of the equation; we’re used to doing that. At least in high school algebra we are. Not looking much better? Try multiplying both left and right sides by ‘r3‘. This gets rid of all the ‘r’ terms on the right-hand side of the equation. Now we’re getting close to the ideal of ‘r = (some mathematics stuff)’. Divide both sides by the constant number ‘n times C’. I know how much everybody likes taking (n+2)-nd roots of a quantity. I’m sure you occasionally just pick an object at random — your age, your telephone number, a potato, a wooden block — and find its (n+2)-nd root. I know. I’ll spoil some of the upcoming paragraphs to say that it’s going to be more useful knowing ‘rn + 2‘ than it is knowing ‘r’. But I’d like to have the radius of a circular orbit on the record. Here it is. I’m labelling it ‘rgrav‘ to point out it’s the radius of a circular orbit for gravitational problems. Might or might not need that in the future, but the label won’t hurt anything. Go ahead and guess whether that agrees with last week’s work. I’m feeling confident. OK, so, we know where a circular orbit might turn up for an arbitrary power function potential energy. Is it stable? We know from the third “Why Stuff Can Orbit” essay that it’s not a sure thing. We can have potential energies that don’t have any circular orbits. So it must be possible there are unstable orbits. Whether our circular orbit is stable demands we do the same work we did last time. It will look a little harder to start, because there’s one more variable in it. What had been ‘-1’ last time is now an ‘n’, and stuff like ‘-2’ becomes ‘n-1’. Is that actually harder? Really? My first impulse when I worked this out was to take the ‘r’ for a circular orbit, the thing worked out five paragraphs above, and plug it in to that expression. This is madness. Don’t do it. Or, you know, go ahead and start doing it and see how long it takes before you regret the errors of your ways. I’m sure we all agree that’s better, right? No, honestly, let me tell you why this is better. When will this expression be true? That’s the product of two expressions. One of them is ‘r-4‘. ‘r’ is the radius of the planet’s orbit. That has to be a positive number. It’s how far the planet is from the origin. The number can’t be anything but positive. So we don’t have to worry about that. SPOILER: I just palmed a card there. Did you see me palm a card there? Because I totally did. Watch for where that card turns up. It’ll be after this next bit. OK. Well. We do know what ‘rn+2‘ is. Worked that out … uhm … twelve(?) paragraphs ago. I’ll say twelve and hope I don’t mess that up in editing. Anyway, what’s important is . So we put that in where ‘rn+2‘ appeared in that above expression. This is going to simplify down some. Look at that first term, with an ‘n C’ in the numerator and again in the denominator. We’re going to be happier soon as we cancel those out. Well, we know has to be positive. The angular momentum ‘L’ might be positive or might be negative but its square is certainly positive. The mass ‘m’ has to be a positive number. So we’ll get a stable equilibrium whenever is greater than 0. That is, whenever . Done. No we’re not done. That’s nonsense. We knew that going in. We saw that a couple essays ago. If your potential energy were something like, say, you wouldn’t have any orbits at all, never mind stable orbits. But 3 is certainly greater than -2. So what’s gone wrong here? Do we know that’s going to exist? … Well, sure. That’s going to be some meaningful number as long as we avoid obvious problems. Like, we can’t have the power ‘n’ be equal to zero, because dividing by zero is all sorts of bad. Also we can’t have the constant ‘C’ be zero, again because dividing by zero is bad. Not a problem, though. If either ‘C’ or ‘n’ were zero, or if both were, then the original potential energy would be a constant number. V(r) would be equal to ‘C’ (if ‘n’ were zero), or ‘0’ (if ‘C’ were zero). It wouldn’t change with the radius ‘r’. This is a case called the ‘free particle’. There’s no force pushing the planet in one direction or another. So if the planet were not moving it would never start. If the planet were already moving, it would keep moving in the same direction in a straight line. No circular orbits. Similarly if ‘n’ were equal to ‘-2’ there’d be problems because the power we raise that parenthetical expression to would be equal to one divided by zero, which is bad. Is there anything else that could be trouble there? ‘L’ is a regular old number, maybe positive, maybe negative. So ‘L2‘ is a positive number. And the mass ‘m’ is a positive number. We don’t know what ‘n’ and C’ are. But as long as their product is positive we’re good. The whole equation will be true. So ‘n’ and ‘C’ can both be negative numbers. We saw that with gravity: . ‘G’ is the gravitational constant of the universe, a positive number. ‘M’ and ‘m’ are masses, also positive. Or ‘n’ and ‘C’ can both be positive numbers. That turns up with spring problems: , where ‘K’ is the ‘spring constant’. That’s some positive number again. That time we found potential energies that didn’t have orbits? They were ones that had a positive ‘C’ and negative ‘n’, or a negative ‘C’ and positive ‘n’. The case we just worked out doesn’t have circular orbits. It’s nice to have that sorted out at least. So what does it mean that we can’t have a stable orbit if ‘n’ is less than or equal to -2? Even if ‘C’ is negative? It turns out that if you have a negative ‘C’ and big negative ‘n’, like say -5, the potential energy drops way down to something infinitely large and negative at smaller and smaller radiuses. If you have a positive ‘C’, the potential energy goes way up at smaller and smaller radiuses. For large radiuses the potential drops to zero. But there’s never the little U-shaped hill in the middle, the way you get for gravity-like potentials or spring potentials or normal stuff like that. Yeah, who would have guessed? What if we do have a stable orbit? How long does an orbit take? How does that relate to the radius of the orbit? We used this radius expression to work out Kepler’s Third Law for the gravity problem last week. We can do that again here. And from this we know what ‘L2‘ is. That’s convenient because we have an ‘L2‘ term in the formula for what the radius is. I’m going to stick with the formula we got for ‘rn+2‘ because that is so, so much easier to work with than ‘r’ by itself. So we go back to that starting point and then substitute what we know ‘L2‘ to be in there. And that last bit is the equivalent of Kepler’s Third Law for our arbitrary power-law style force. Are we right? Hard to say offhand. We can check that we aren’t wrong, at least. We can check against the gravitational potential energy. For this ‘n’ is equal to -1. ‘C’ is equal to ‘-G M m’. Make those substitutions; what do we get? Well, that is what we expected for this case. So the work looks good, this far. Comforting. So now we can work out orbits. At least orbits for a central force problem. Those are ones where a particle — it’s easy to think of it as a planet — is pulled towards the center of the universe. How strong that pull is depends on some constants. But it only changes as the distance the planet is from the center changes. What we’d like to know is whether there are circular orbits. By “we” I mean “mathematical physicists”. And I’m including you in that “we”. If you’re reading this far you’re at least interested in knowing how mathematical physicists think about stuff like this. It’s easiest describing when these circular orbits exist if we start with the potential energy. That’s a function named ‘V’. We write it as ‘V(r)’ to show it’s an energy that changes as ‘r’ changes. By ‘r’ we mean the distance from the center of the universe. We’d use ‘d’ for that except we’re so used to thinking of distance from the center as ‘radius’. So ‘r’ seems more compelling. Sorry. Besides the potential energy we need to know the angular momentum of the planet (or whatever it is) moving around the center. The amount of angular momentum is a number we call ‘L’. It might be positive, it might be negative. Also we need the planet’s mass, which we call ‘m’. The angular momentum and mass let us write a function called the effective potential energy, ‘Veff(r)’. The planet (or whatever) can have a circular orbit around the center at any radius which makes the equation true. The circular orbit will be stable if the radius of its orbit makes the second derivative of the effective potential, , some number greater than zero. We’re interested in stable orbits because usually unstable orbits are boring. They might exist but any little perturbation breaks them down. The mathematician, ordinarily, sees this as a useless solution except in how it describes different kinds of orbits. The physicist might point out that sometimes it can take a long time, possibly millions of years, before the perturbation becomes big enough to stand out. Indeed, it’s an open question whether our solar system is stable. While it seems to have gone millions of years without any planet changing its orbit very much we haven’t got the evidence to say it’s impossible that, say, Saturn will be kicked out of the solar system anytime soon. Or worse, that Earth might be. “Soon” here means geologically soon, like, in the next million years. I realize now I didn’t explain the notation for the second derivative before. It looks funny because that’s just the best we can work out. In that fraction the ‘d’ isn’t a number so we can’t cancel it out. And the superscript ‘2’ doesn’t mean squaring, at least not the way we square numbers. There’s a functional analysis essay in there somewhere. Again I’m sorry about this but there’s a lot of things mathematicians want to write out and sometimes we can’t find a way that avoids all confusion. Roll with it. So that explains the whole thing clearly and easily and now nobody could be confused and yeah I know. If my Classical Mechanics professor left it at that we’d have open rebellion. Let’s do an example. There are two and a half good examples. That is, they’re central force problems with answers we know. One is gravitation: we have a planet orbiting a star that’s at the origin. Another is springs: we have a mass that’s connected by a spring to the origin. And the half is electric: put a positive electric charge at the center and have a negative charge orbit that. The electric case is only half a problem because it’s the same as the gravitation problem except for what the constants involved are. Electric charges attract each other crazy way stronger than gravitational masses do. But that doesn’t change the work we do. This is a lie. Electric charges accelerating, and just orbiting counts as accelerating, cause electromagnetic effects to happen. They give off light. That’s important, but it’s also complicated. I’m not going to deal with that. I’m going to do the gravitation problem. After all, we know the answer! By Kepler’s something law, something something radius cubed something G M … something … squared … After all, we can look up the answer! Here ‘G’ is a constant, called the Gravitational Constant. It’s how strong gravity in the universe is. It’s not very strong. ‘M’ is the mass of the sun. ‘m’ is the mass of the planet. To make sense ‘M’ should be a lot bigger than ‘m’. ‘r’ is how far the planet is from the sun. And yes, that’s one-over-r, not one-over-r-squared. This is the potential energy of the planet being at a given distance from the sun. One-over-r-squared gives us how strong the force attracting the planet towards the sun is. Different thing. Related thing, but different thing. Just listing all these quantities one after the other means ‘multiply them together’, because mathematicians multiply things together a lot and get bored writing multiplication symbols all the time. We can tidy that up a little bit: -(-1) is another way of writing 1. The second term has two times something divided by 2. We don’t need to be that complicated. In fact, when I worked out my notes I went directly to this simpler form, because I wasn’t going to be thrown by that. I imagine I’ve got people reading along here who are watching these equations warily, if at all. They’re ready to bolt at the first sign of something terrible-looking. There’s nothing terrible-looking coming up. All we’re doing from this point on is really arithmetic. It’s multiplying or adding or otherwise moving around numbers to make the equation prettier. It happens we only know those numbers by cryptic names like ‘G’ or ‘L’ or ‘M’. You can go ahead and pretend they’re ‘4’ or ‘5’ or ‘7’ if you like. You know how to do the steps coming up. So! We allegedly can have a circular orbit when this first derivative is equal to zero. What values of ‘r’ make true this equation? Very good. I’d even say pretty. It’s got all those capital letters and one little lowercase. Something squared in the numerator and the denominator. Aesthetically pleasant. Stinks a little that it doesn’t look like anything we remember from Kepler’s Laws once we’ve looked them up. We can fix that, though. The key is the angular momentum ‘L’ there. I haven’t said anything about how that number relates to anything. It’s just been some constant of the universe. In a sense that’s fair enough. Angular momentum is conserved, exactly the same way energy is conserved, or the way linear momentum is conserved. Why not just let it be whatever number it happens to be? The angular momentum of a thing is its moment of inertia times its angular velocity. I’m glad to have cleared that up for you. The moment of inertia of a thing describes how easy it is to start it spinning, or stop it spinning, or change its spin. It’s a lot like inertia. What it is depends on the mass of the thing spinning, and how that mass is distributed, and what it’s spinning around. It’s the first part of physics that makes the student really have to know volume integrals. We don’t have to know volume integrals. A single point mass spinning at a constant speed at a constant distance from the origin is the easy angular momentum to figure out. A mass ‘m’ at a fixed distance ‘r’ from the center of rotation moving at constant speed ‘v’ has an angular momentum of ‘m’ times ‘r’ times ‘v’. So great; we’ve turned ‘L’ which we didn’t know into ‘m r v’, where we know ‘m’ and ‘r’ but don’t know ‘v’. We’re making progress, I promise. The planet’s tracing out a circle in some amount of time. It’s a circle with radius ‘r’. So it traces out a circle with perimeter ‘2 π r’. And it takes some amount of time to do that. Call that time ‘T’. So its speed will be the distance travelled divided by the time it takes to travel. That’s . Again we’ve changed one unknown number ‘L’ for another unknown number ‘T’. But at least ‘T’ is an easy familiar thing: it’s how long the orbit takes. Remember that one? Now put what I just said ‘L’ was, in where ‘L’ shows up in that equation. I agree, this looks like a mess and possibly a disaster. It’s not so bad. Do some cleaning up on that numerator. That’s looking a lot better, isn’t it? We even have something we can divide out: the mass of the planet is just about to disappear. This sounds bizarre, but remember Kepler’s laws: the mass of the planet never figures into things. We may be on the right path yet. And hey! That looks really familiar. A circular orbit’s radius cubed is some multiple of the square of the orbit’s time. Yes. This looks right. At least it looks reasonable. Someone else can check if it’s right. I like the look of it. I’d like to talk about the different … oh, dear. Yes. You’re going to ask about that, aren’t you? Ugh. All right. I’ll do it. How do we know this is a stable orbit? Well, it just is. If it weren’t the Earth wouldn’t have a Moon after all this. Heck, the Sun wouldn’t have an Earth. At least it wouldn’t have a Jupiter. If the solar system is unstable, Jupiter is probably the most stable part. But that isn’t convincing. I’ll do this right, though, and show what the second derivative tells us. It tells us this is too a stable orbit. So. The thing we have to do is find the second derivative of the effective potential. This we do by taking the derivative of the first derivative. Then we have to evaluate this second derivative and see what value it has for the radius of our circular orbit. If that’s a positive number, then the orbit’s stable. If that’s a negative number, then the orbit’s not stable. This isn’t hard to do, but it isn’t going to look pretty. OK. So the derivative of this with respect to ‘r’ isn’t hard to evaluate again. This is again a function with a bunch of terms that are all a constant times r to a power. That’s the easiest sort of thing to differentiate that isn’t just something that never changes. And I admit I don’t know what number that is. But here’s what I do know: ‘G’ is a positive number. ‘M’ is a positive number. ‘m’ is a positive number. ‘L’ might be positive or might be negative, but ‘L6‘ is a positive number either way. So this is a bunch of positive numbers multiplied and divided together. So this second derivative what ever it is must be a positive number. And so this circular orbit is stable. Give the planet a little nudge and that’s all right. It’ll stay near its orbit. I’m sorry to put you through that but some people raised the, honestly, fair question. So this is the process you’d use to start understanding orbits for your own arbitrary potential energy. You can find the equivalent of Kepler’s Third Law, the one connecting orbit times and orbit radiuses. And it isn’t really hard. You need to know enough calculus to differentiate one function, and then you need to be willing to do a pile of arithmetic on letters. It’s not actually hard. Next time I hope to talk about the other kinds of central forces that you might get. We only solved one problem here. We can solve way more than that. My title’s hyperbole, to the extent it isn’t clickbait. Of course physics works. By “work” I mean “model the physical world in useful ways”. If it didn’t work then we would call it “pure” mathematics instead. Mathematicians would study it for its beauty. Physicists would be left to fend for themselves. “Useful” I’ll say means “gives us something interesting to know”. “Interesting” I’ll say if you want to ask what that means then I think you’re stalling. But what I mean is that Newtonian physics, the physics learned in high school, doesn’t work. Well, it works, in that if you set up a problem right and calculate right you get answers that are right. It’s just not efficient, for a lot of interesting problems. Don’t ask me about interesting again. I’ll just say the central-force problems from this series are interesting. Newtonian, high school type, physics works fine. It shines when you have only a few things to keep track of. In this central force problem we have one object, a planet-or-something, that moves. And only one force, one that attracts the planet to or repels the planet from the center, the Origin. This is where we’d put the sun, in a planet-and-sun system. So that seems all right as far as things go. It’s less good, though, if there’s constraints. If it’s not possible for the particle to move in any old direction, say. That doesn’t turn up here; we can imagine a planet heading in any direction relative to the sun. But it’s also less good if there’s a symmetry in what we’re studying. And in this case there is. The strength of the central force only changes based on how far the planet is from the origin. The direction only changes based on what direction the planet is relative to the origin. It’s a bit daft to bother with x’s and y’s and maybe even z’s when all we care about is the distance from the origin. That’s a number we’ve called ‘r’. So this brings us to Lagrangian mechanics. This was developed in the 18th century by Joseph-Louis Lagrange. He’s another of those 18th century mathematicians-and-physicists with his name all over everything. Lagrangian mechanics are really, really good when there’s a couple variables that describe both what we’d like to observe about the system and its energy. That’s exactly what we have with central forces. Give me a central force, one that’s pointing directly toward or away from the origin, and that grows or shrinks as the radius changes. I can give you a potential energy function, V(r), that matches that force. Give me an angular momentum L for the planet to have, and I can give you an effective potential energy function, Veff(r). And that effective potential energy lets us describe how the coordinates change in time. The method looks roundabout. It depends on two things. One is the coordinate you’re interested in, in this case, r. The other is how fast that coordinate changes in time. This we have a couple of ways of denoting. When working stuff out on paper that’s often done by putting a little dot above the letter. If you’re typing, dots-above-the-symbol are hard. So we mark it as a prime instead: r’. This works well until the web browser or the word processor assumes we want smart quotes and we already had the r’ in quote marks. At that point all hope of meaning is lost and we return to communicating by beating rocks with sticks. We live in an imperfect world. What we get out of this is a setup that tells us how fast r’, how fast the coordinate we’re interested in changes in time, itself changes in time. If the coordinate we’re interested in is the ordinary old position of something, then this describes the rate of change of the velocity. In ordinary English we call that the acceleration. What makes this worthwhile is that the coordinate doesn’t have to be the position. It also doesn’t have to be all the information we need to describe the position. For the central force problem r here is just how far the planet is from the center. That tells us something about its position, but not everything. We don’t care about anything except how far the planet is from the center, not yet. So it’s fine we have a setup that doesn’t tell us about the stuff we don’t care about. How fast r’ changes in time will be proportional to how fast the effective potential energy, Veff(r), changes with its coordinate. I so want to write “changes with position”, since these coordinates are usually the position. But they can be proxies for the position, or things only loosely related to the position. For an example that isn’t a central force, think about a spinning top. It spins, it wobbles, it might even dance across the table because don’t they all do that? The coordinates that most sensibly describe how it moves are about its rotation, though. What axes is it rotating around? How do those change in time? Those don’t have anything particular to do with where the top is. That’s all right. The mathematics works just fine. A circular orbit is one where the radius doesn’t change in time. (I’ll look at non-circular orbits later on.) That is, the radius is not increasing and is not decreasing. If it isn’t getting bigger and it isn’t getting smaller, then it’s got to be staying the same. Not all higher mathematics is tricky. The radius of the orbit is the thing I’ve been calling r all this time. So this means that r’, how fast r is changing with time, has to be zero. Now a slightly tricky part. How fast is r’, the rate at which r changes, changing? Well, r’ never changes. It’s always the same value. Anytime something is always the same value the rate of its change is zero. This sounds tricky. The tricky part is that it isn’t tricky. It’s coincidental that r’ is zero and the rate of change of r’ is zero, though. If r’ were any fixed, never-changing number, then the rate of change of r’ would be zero. It happens that we’re interested in times when r’ is zero. So we’ll find circular orbits where the change in the effective potential energy, as r changes, is zero. There’s an easy-to-understand intuitive idea of where to find these points. Look at a plot of Veff and imagine this is a smooth track or the cross-section of a bowl or the landscaping of a hill. Imagine dropping a ball or a marble or a bearing or something small enough to roll in it. Where does it roll to a stop? That’s where the change is zero. It’s too much bother to make a bowl or landscape a hill or whatnot for every problem we’re interested in. We might do it anyway. Mathematicians used to, to study problems that were too complicated to do by useful estimates. These were “analog computers”. They were big in the days before digital computers made it no big deal to simulate even complicated systems. We still need “analog computers” or models sometimes. That’s usually for problems that involve chaotic stuff like turbulent fluids. We call this stuff “wind tunnels” and the like. It’s all a matter of solving equations by building stuff. We’re not working with problems that complicated. There isn’t the sort of chaos lurking in this problem that drives us to real-world stuff. We can find these equilibriums by working just with symbols instead. We were chatting about central forces. In these a small object — a satellite, a planet, a weight on a spring — is attracted to the center of the universe, called the origin. We’ve been studying this by looking at potential energy, a function that in this case depends only on how far the object is from the origin. But to find circular orbits, we can’t just look at the potential energy. We have to modify this potential energy to account for angular momentum. This essay I mean to discuss that angular momentum some. Let me talk first about the potential energy. Mathematical physicists usually write this as a function named U or V. I’m using V. That’s what my professor used teaching this, back when I was an undergraduate several hundred thousand years ago. A central force, by definition, changes only with how far you are from the center. I’ve put the center at the origin, because I am not a madman. This lets me write the potential energy as V = V(r). V(r) could, in principle, be anything. In practice, though, I am going to want it to be r raised to a power. That is, V(r) is equal to C rn. The ‘C’ here is a constant. It’s a scaling constant. The bigger a number it is the stronger the central force. The closer the number is to zero the weaker the force is. In standard units, gravity has a constant incredibly close to zero. This makes orbits very big things, which generally works out well for planets. In the mathematics of masses on springs, the constant is closer to middling little numbers like 1. The ‘n’ here is a deceiver. It’s a constant number, yes, and it can be anything we want. But the use of ‘n’ as a symbol has connotations. Usually when a mathematician or a physicist writes ‘n’ it’s because she needs a whole number. Usually a positive whole number. Sometimes it’s negative. But we have a legitimate central force if ‘n’ is any real number: 2, -1, one-half, the square root of π, any of that is good. If you just write ‘n’ without explanation, the reader will probably think “integers”, possibly “counting numbers”. So it’s worth making explicit when this isn’t so. It’s bad form to surprise the reader with what kind of number you’re even talking about. C rn isn’t the only kind of central force that could exist. Any function rule would do. But it’s enough. If we wanted a more complicated rule we could just add two, or three, or more potential energies together. This would give us , with C1 and C2 two possibly different numbers, and n1 and n2 two definitely different numbers. (If n1 and n2 were the same number then we should just add C1 and C2 together and stop using a more complicated expression than we need.) Remember that Newton’s Law of Motion about the sum of multiple forces being something vector something something direction? When we look at forces as potential energy functions, that law turns into just adding potential energies together. They’re well-behaved that way. And if we can add these r-to-a-power potential energies together then we’ve got everything we need. Why? Polynomials. We can approximate most any potential energy that would actually happen with a big enough polynomial. Or at least a polynomial-like function. These r-to-a-power forces are a basis set for all the potential energies we’re likely to care about. Understand how to work with one and you understand how to work with them all. Well, one exception. 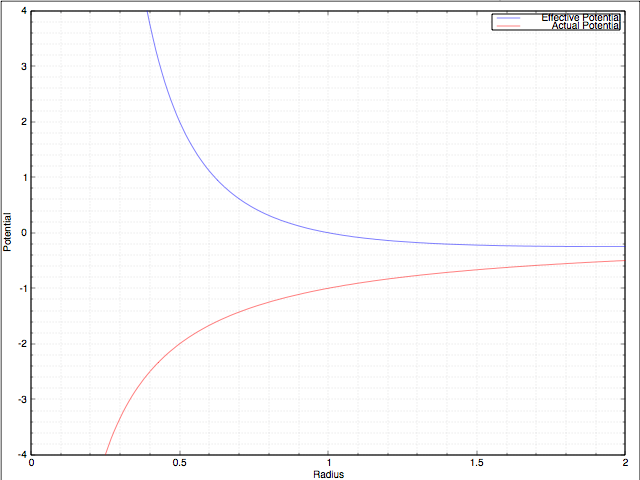 The logarithmic potential, V(r) = C log(r), is really interesting. And it has real-world applicability. It describes how strongly two vortices, two whirlpools, attract each other. You can write the logarithm as a polynomial. But logarithms are pretty well-behaved functions. You might be better off just doing that as a special case. Still, at least to start with, we’ll stick with V(r) = C rn and you know what I mean by all those letters now. So I’m free to talk about angular momentum. You’ve probably heard of momentum. It’s got something to do with movement, only sports teams and political campaigns are always gaining or losing it somehow. When we talk of that we’re talking of linear momentum. It describes how much mass is moving how fast in what direction. So it’s a vector, in three-dimensional space. Or two-dimensional space if you’re making the calculations easier. To find what the vector is, we make a list of every object that’s moving. We take its velocity — how fast it’s moving and in what direction — and multiply that by its mass. Mass is a single number, a scalar, and we’re always allowed to multiply a vector by a scalar. This gets us another vector. Once we’ve done that for everything that’s moving, we add all those product vectors together. We can always add vectors together. And this gives us a grand total vector, the linear momentum of the system. And that’s conserved. If one part of the system starts moving slower it’s because other parts are moving faster, and vice-versa. In the real world momentum seems to evaporate. That’s because some of the stuff moving faster turns out to be air objects bumped into, or particles of the floor that get dragged along by friction, or other stuff we don’t care about. That momentum can seem to evaporate is what makes its use in talking about ports teams or political campaigns make sense. It also annoys people who want you to know they understand science words better than you. So please consider this my authorization to use “gaining” and “losing” momentum in this sense. Ignore complainers. They’re the people who complain the word “decimate” gets used to mean “destroy way more than ten percent of something”, even though that’s the least bad mutation of an English word’s meaning in three centuries. Angular momentum is also a vector. It’s also conserved. We can calculate what that vector is by the same sort of process, that of calculating something on each object that’s spinning and adding it all up. In real applications it can seem to evaporate. But that’s also because the angular momentum is going into particles of air. Or it rubs off grease on the axle. Or it does other stuff we wish we didn’t have to deal with. You might ask: wait, what about stuff like a wheel that’s spinning around its center? Or a ball being spun? That can’t be an angular momentum of zero? How do we work that out? The answer is: calculus. Also, we don’t need that. This central force problem I’ve framed so that we barely even need algebra for it. See, we only have a single object that’s moving. That’s the planet or satellite or weight or whatever it is. It’s got some mass, the value of which we call ‘m’ because why make it any harder on ourselves. And it’s spinning around the origin. We’ve been using ‘r’ to mean the number describing how far it is from the origin. That’s the distance to the axis it’s spinning around. Its velocity — well, we don’t have any symbols to describe what that is yet. But you can imagine working that out. Or you trust that I have some clever mathematical-physics tool ready to introduce to work it out. I have, kind of. I’m going to ignore it altogether. For now. The symbol we use for the total angular momentum in a system is . The little arrow above the symbol is one way to denote “this is a vector”. It’s a good scheme, what with arrows making people think of vectors and it being easy to write on a whiteboard. In books, sometimes, we make do just by putting the letter in boldface, L, which is easier for old-fashioned word processors to do. If we’re sure that the reader isn’t going to forget that L is this vector then we might stop highlighting the fact altogether. That’s even less work to do. It’s going to be less work yet. Central force problems like this mean the object can move only in a two-dimensional plane. (If it didn’t, it wouldn’t conserve angular momentum: the direction of would have to change. Sounds like magic, but trust me.) The angular momentum’s direction has to be perpendicular to that plane. If the object is spinning around on a sheet of paper, the angular momentum is pointing straight outward from the sheet of paper. It’s pointing toward you if the object is moving counterclockwise. It’s pointing away from you if the object is moving clockwise. What direction it’s pointing is locked in. All we need to know is how big this angular momentum vector is, and whether it’s positive or negative. So we just care about this number. We can call it ‘L’, no arrow, no boldface, no nothing. It’s just a number, the same as is the mass ‘m’ or distance from the origin ‘r’ or any of our other variables. If ‘L’ is zero, this means there’s no total angular momentum. This means the object can be moving directly out from the origin, or directly in. This is the only way that something can crash into the center. So if setting L to be zero doesn’t allow that then we know we did something wrong, somewhere. If ‘L’ isn’t zero, then the object can’t crash into the center. If it did we’d be losing angular momentum. The object’s mass times its distance from the center times its perpendicular speed would have to be some non-zero number, even when the distance was zero. We know better than to look for that. You maybe wonder why we use ‘L’ of all letters for the angular momentum. I do. I don’t know. I haven’t found any sources that say why this letter. Linear momentum, which we represent with , I know. Or, well, I know the story every physicist says about it. p is the designated letter for linear momentum because we used to use the word “impetus”, as in “impulse”, to mean what we mean by momentum these days. And “p” is the first letter in “impetus” that isn’t needed for some more urgent purpose. (“m” is too good a fit for mass. “i” has to work both as an index and as that number which, squared, gives us -1. And for that matter, “e” we need for that exponentials stuff, and “t” is too good a fit for time.) That said, while everybody, everybody, repeats this, I don’t know the source. Perhaps it is true. I can imagine, say, Euler or Lagrange in their writing settling on “p” for momentum and everybody copying them. I just haven’t seen a primary citation showing this is so. Anyway, “p” for momentum is well-established. So I would guess that when mathematical physicists needed a symbol for angular momentum they looked for letters close to “p”. When you get into more advanced corners of physics “q” gets called on to be position a lot. (Momentum and position, it turns out, are nearly-identical-twins mathematically. So making their symbols p and q offers aesthetic charm. Also great danger if you make one little slip with the pen.) “r” is called on for “radius” a lot. Looking on, “t” is going to be time. On the other side of the alphabet, well, “o” is just inviting danger. “n” we need to count stuff. “m” is mass or we’re crazy. “l” might have just been the nearest we could get to “p” without intruding on a more urgently-needed symbol. (“s” we use a lot for parameters like length of an arc that work kind of like time but aren’t time.) And then shift to the capital letter, I expect, because a lowercase l looks like a “1”, to everybody’s certain doom. V(r) was the original potential, whatever that was. The modifying term, with this square of the angular momentum and all that, I kind of hope you’ll just accept on my word. The L2 means that whether the angular momentum is positive or negative, the potential will grow very large as the radius gets small. If it didn’t, there might not be orbits at all. And if the angular momentum is zero, then the effective potential is the same original potential that let stuff crash into the center. where n might be an integer. I’m going to pretend a while longer that it might not be, though. C is certainly some number, maybe positive, maybe negative. If you pick some values for C, n, L, and m you can sketch this out. If you just want a feel for how this Veff looks it doesn’t much matter what values you pick. Changing values just changes the scale, that is, where a circular orbit might happen. It doesn’t change whether it happens. Picking some arbitrary numbers is a good way to get a feel for how this sort of problem works. It’s good practice. Sketching will convince you there are energy minimums, where we can get circular orbits. It won’t say where to find them without some trial-and-error or building a model of this energy and seeing where a ball bearing dropped into it rolls to a stop. We can do this more efficiently. Before the big distractions of Theorem Thursdays and competitive pinball events and all that I was writing up the mathematics of orbits. Last time I’d got to establishing that there can’t be such a thing as an orbit. This seems to disagree with what a lot of people say we can observe. So I want to resolve that problem. Yes, I’m aware I’m posting this on a Thursday, which I said I wasn’t going to do because it’s too hard on me to write. I don’t know how it worked out like that. Let me get folks who didn’t read the previous stuff up to speed. I’m using as model two things orbiting each other. I’m going to call it a sun and a planet because it’s way too confusing not to give things names. But they don’t have to be a sun and a planet. They can be a planet and moon. They can be a proton and an electron if you want to pretend quantum mechanics isn’t a thing. They can be a wood joist and a block of rubber connected to it by a spring. That’s a legitimate central force. They can even be stuff with completely made-up names representing made-up forces. So far I’m supposing the things are attracted or repelled by a force with a strength that depends on how far they are from each other but on nothing else. Also I’m supposing there are only two things in the universe. This is because the mathematics of two things with this kind of force is easy to do. An undergraduate mathematics or physics major can do it. The mathematics of three things is too complicated to do. I suppose somewhere around two-and-a-third things the mathematics hard enough you need an expert but the expert can do it. Mathematicians and physicists will call this sort of problem a “central force” problem. We can make it easier by supposing the sun is at the center of the universe, or at least our coordinate system. So we don’t have to worry about it moving. It’s just there at the center, the “origin”, and it’s only the planet that moves. Forces are tedious things to deal with. They’re vectors. In this context that makes them bundles of three quantities each related to the other two. We can avoid a lot of hassle by looking at potential energy instead. Potential energy is a scalar, a single number. Numbers are nice and easy. Calculus tells us how to go from potential energy to forces, in case we need the forces. It also tells us how to go from forces to potential energy, so we can do the easier problem instead. So we do. The potential energy for a force like gravity or electric attraction looks like the distance, r, raised to a power. And then multiplied by some number, which is where we hide gravitational constants and masses and all that stuff. Generally, it looks like V(r) = C rn where C is some number and n is some other number. For gravity and electricity that number is -1. For two particles connected by a spring that number n is +2. Could be anything. The trouble is if you draw these curves you realize that a marble dropped in would never come to a stop. It would roll down to the center, the planet falling into the sun. Or it would roll away forever, the planet racing into deep space. Either way it doesn’t orbit or do anything near orbiting. This seems wrong. It’s not, though. Suppose the force is repelling, that is, the potential energy gets to be smaller and smaller numbers as the distance increases. Then the two things do race away from each other. Physics students are asked to imagine two positive charges let loose next to each other. Physics students understand they’ll go racing away from each other, even though we don’t see stuff in the real world that does that very often. We suppose the students understand, though. These days I guess you can make an animation of it and people will accept that as if it’s proof of anything. Suppose the force is attracting. Imagine just dropping a planet out somewhere by a sun. Set it carefully just in place and let it go and get out of the way before happens. This is what we do in physics and mathematics classes, so that’s the kind of fun stuff you skipped if you majored in something else. But then we go on to make calculations about it. But that’ll orbit, right? It won’t just drop down into the sun and get melted or something? Not so, the way I worded it. If we set the planet into space so it was holding still, not moving at all, then it will fall. Plummet, really. The planet’s attracted to the sun, and it moves in that direction, and it’s just going to keep moving that way. If it were as far from the center as the Earth is from the Sun it’ll take its time, yes, but it’ll fall into the sun and not do anything remotely like orbiting. And yet there’s still orbits. What’s wrong? What’s wrong is a planet isn’t just sitting still there waiting to fall into the sun. Duh, you say. But why isn’t it just sitting still? That’s because it’s moving. Might be moving in any direction. We can divide that movement up into two pieces. One is the radial movement, how fast it’s moving towards or away from the center, that is, along the radius between sun and planet. If it’s a circular orbit this speed is zero; the planet isn’t moving any closer or farther away. If this speed isn’t zero it might affect how fast the planet falls into the sun, but it won’t affect the fact of whether it does or not. No more than how fast you toss a ball up inside a room changes whether it’ll eventually hit the floor. </p. It’s the other part, the transverse velocity, that matters. This is the speed the thing is moving perpendicular to the radius. It’s possible that this is exactly zero and then the planet does drop into the sun. It’s probably not. And what that means is that the planet-and-sun system has an angular momentum. Angular momentum is like regular old momentum, only for spinning. And as with regular momentum, the total is conserved. It won’t change over time. When I was growing up this was always illustrated by thinking of ice skaters doing a spin. They pull their arms in, they spin faster. They put their arms out, they spin slower. The same thing has to happen with planets orbiting a sun. If the planet moves closer to the sun, it speeds up; if it moves farther away, it slows down. To fall into the exact center while conserving angular momentum demands the planet get infinitely fast. This they don’t typically do. There was a tipoff to this. It’s from knowing the potential energy V(r) only depends on the distance between sun and planet. If you imagine taking the system and rotating it all by any angle, you wouldn’t get any change in the forces or the way things move. It would just change the values of the coordinates you used to describe this. Mathematical physicists describe this as being “invariant”, which means what you’d imagine, under a “continuous symmetry”, which means a change that isn’t … you know, discontinuous. Rotating thing as if they were on a pivot, that is, instead of (like) reflecting them through a mirror. And invariance under a continuous symmetry like this leads to a conservation law. This is known from Noether’s Theorem. You can find explained quite well on every pop-mathematics and pop-physics blog ever. It’s a great subject for pop-mathematics/physics writing. The idea, that the geometry of a problem tells us something about its physics and vice-versa, is important. It’s a heady thought without being so exotic as to seem counter-intuitive. And its discoverer was Dr Amalie Emmy Noether. She’s an early-20th-century demonstration of the first-class work that one can expect women to do when they’re not driven out of mathematics. You see why the topic is so near irresistible. So we have to respect the conservation of angular momentum. This might sound like we have to give up on treating circular orbits as one-variable problems. We don’t have to just yet. We will, eventually, want to look at not just how far the planet is from the origin but also in what direction it is. We don’t need to do that yet. We have a brilliant hack. We can represent the conservation of angular momentum as a slight repulsive force. It’s not very big if the angular momentum is small. It’s not going to be a very big force unless the planet gets close to the origin, that is, until r gets close to zero. But it does grow large and acts as if the planet is being pushed away. We consider that a pseudoforce. It appears because our choice of coordinates would otherwise miss some important physics. And that’s fine. It’s not wrong any more than, say, a hacksaw is the wrong tool to cut through PVC pipe just because you also need a vise. This pseudoforce can be paired with a pseduo-potential energy. One of the great things about the potential-energy view of physics is that adding two forces together is as easy as adding their potential energies together. We call the sum of the original potential energy and the angular-momentum-created pseudopotential the “effective potential energy”. 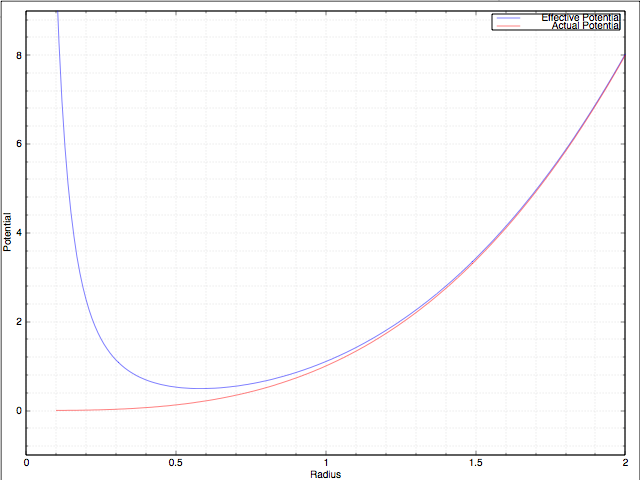 Far from the origin, for large radiuses r, this will be almost identical to the original potential energy. Close to the origin, this will be a function that rises up steeply. And as a result there can suddenly be a local minimum. There can be a circular orbit. Figure 1. The potential energy of a spring — the red line — and the effective potential energy — the blue line — when the angular momentum is added as a pseudoforce. Without angular momentum in consideration the only equilibrium is at the origin. With angular momentum there’s some circular orbit, somewhere. Don’t pay attention to the numbers on the axes. They don’t mean anything. Figure 2. The potential energy of a gravitational attraction — the red line — and the effective potential energy — the blue line — when the angular momentum is added as a pseudoforce. Without angular momentum in consideration there’s no equilibrium. The thing, a planet, falls into the center, the sun. With angular momentum there’s some circular orbit. As before the values of the numbers don’t matter and you should just ignore them. The location of the minimum — the radius of the circular orbit — will depend on the original potential, of course. It’ll also depend on the angular momentum. The smaller the angular momentum the closer to the origin will be the circular orbit. If the angular momentum is zero we have the original potential and the planet dropping into the center again. If the angular momentum is large enough there might not even be a minimum anymore. That matches systems where the planet has escape velocity and can go plunging off into deep space. And we can see this by looking at the plot of the effective velocity even before we calculate things. Figure 3. Gravitational potential energy — the red line — and the effective potential energy — the blue line — when angular momentum is considered. In this case the angular momentum is so large, that is, the planet is moving so fast, that there are no orbits. The planet’s reached escape velocity and can go infinitely far away from the sun. This only goes so far as demonstrating a circular orbit should exist. Or giving some conditions for which a circular orbit wouldn’t. We might want to know something more, like where that circular orbit is. Or if it’s possible for there to be an elliptic orbit. Or other shapes. I imagine it’s possible to work this out with careful enough drawings. But at some point it gets easier to just calculate things. We’ll get to that point soon. As I threatened last week, I want to talk some about central forces. They’re forces in which one particle attracts another with a force that depends only on how far apart the two are. Last week’s essay described some of the assumptions behind the model. Mostly, we can study two particles interacting as if it were one particle hovering around the origin. The origin is some central reference point. If we’re looking for a circular orbit then we only have to worry about one variable. This would be ‘r’, the radius of the orbit: how far the planet is from the sun it orbits. Now, central forces can follow any rule you like. Not in reality, of course. In reality there’s two central forces you ever see. One is gravity (electric attraction or repulsion follows the same rule) and the other is springs. But we can imagine there being others. At the end of this string of essays I hope to show why there’s special things about these gravity and spring-type forces. And by imagining there’s others we can learn something about why we only actually see these. So now I’m going to stop talking about forces. I’ll talk about potential energy instead. There’s several reasons for this, but they all come back to this one: energy is easier to deal with. Energy is a scalar, a single number. A force is a vector, which for this kind of physics-based problem is an array of numbers. We have less to deal with if we stick to energy. If we need forces later on we can get them from the energy. We’ll need calculus to do that, but it won’t be the hard parts of calculus. The potential energy will be some function. As a central force it’ll depend only on the distance, r, that a particle is from the origin. It’s convenient to have a name for this. So I will use a common name: V(r). V is a common symbol to use for potential energy. U is another. The (r) emphasizes that this is some function which depends on r. V(r) doesn’t commit us to any particular function, not at this point. You might ask: why is the potential energy represented with V, or with U? And I don’t really know. Sometimes we’ll use PE to mean potential energy, which is as clear a shorthand name as we could hope for. But a name that’s two letters like that tends to be viewed with suspicion when we have to do calculus work on it. The label looks like the product of P and E, and derivatives of products get tricky. So it’s a less popular label if you know you’re going take the derivative of the potential energy anytime soon. EP can also get used, and the subscript means it doesn’t look like the product of any two things. Still, at least in my experience, U and V are most often used. As I say, I don’t know just why it should be them. It might just be that the letters were available when someone wrote a really good physics textbook. If we want to assume there must be some reason behind this letter choice I have seen a plausible guess. Potential energy is used to produce work. Work is W. So potential energy should be a letter close to W. That suggests U and V, both letters that are part of the letter W. (Listen to the name of ‘W’, and remember that until fairly late in the game U and V weren’t clearly distinguished as letters.) But I do not know of manuscript evidence suggesting that’s what anyone every thought. It is at best a maybe useful mnemonic. Here’s an advantage that using potential energy will give us: we can postpone using calculus a little. Not for quantitative results. Not for ones that describe exactly where something should orbit. But it’s good for qualitative results. We can answer questions like “is there a circular orbit” and “are there maybe several plausible orbits” just by looking at a picture. That picture is a plot of the values of V(r) against r. And that can be anything. I mean it. Take your preferred drawing medium and draw any wiggly curve you like. It can’t loop back or cross itself or something like that, but it can be as smooth or as squiggly as you like. That’s your central-force potential energy V(r). Are there any circular orbits for this potential? Calculus gives us the answer, but we don’t need that. For a potential like our V(r), that depend on one variable, we can just look. (We could also do this for a potential that depends on two variables.) Take your V(r). Imagine it’s the sides of a perfectly smooth bowl or track or something. Now imagine dropping a marble or a ball bearing or something nice and smooth on it. Does the marble come to a rest anywhere? That’s your equilibrium. That’s where a circular orbit can happen. Figure 1. A generic yet complicated V(r). Spoiler: I didn’t draw this myself because I figured using Octave was easier than using ArtRage on my iPad. We’re using some real-world intuition to skip doing analysis. That’s all right in this case. Newtonian mechanics say that a particle’s momentum changes in the direction of a force felt. If a particle doesn’t change its mass, then that means it accelerates where the force, uh, forces it. And this sort of imaginary bowl or track matches up the potential energy we want to study with a constrained gravitational potential energy. My generic V(r) was a ridiculous function. This sort of thing doesn’t happen in the real world. But they might have. Wiggly functions like that were explored in the 19th century by physicists trying to explain chemistry. They hoped complicated potentials would explain why gases expanded when they warmed and contracted when they cooled. The project failed. Atoms follow quantum-mechanics laws that match only vaguely match Newtonian mechanics like this. But just because functions like these don’t happen doesn’t mean we can’t learn something from them. We can’t study every possible V(r). Not at once. Not without more advanced mathematics than I want to use right now. What I’d like to do instead is look at one family of V(r) functions. There will be infinitely many different functions here, but they’ll all resemble each other in important ways. If you’ll allow me to introduce two new numbers we can describe them all with a single equation. The new numbers I’ll name C and n. They’re both constants, at least for this problem. They’re some numbers and maybe at some point I’ll care which ones they are, but it doesn’t matter. If you want to pretend that C is another way to write “eight”, go ahead. n … well, you can pretend that’s just another way to write some promising number like “two” for now. I’ll say when I want to be more specific about it. There are some values of n that it will turn out are meaningful. If n is equal to 2, then this is the potential energy for two particles connected by a spring. You might complain there are very few things in the world connected to other things by springs. True enough, but a lot of things act as if they were springs. This includes most anything that’s near but pushed away from a stable equilibrium. It’s a potential worth studying. If n is equal to -1, then this is the potential energy for two particles attracting each other by gravity or by electric charges. And here there’s an important little point. If the force is attractive, like gravity or like two particles having opposite electric charges, then we need C to be a negative number. If the force is repulsive, like two particles having the same electric charge, then we need C to be a positive number. Although n equalling two, and n equalling negative one, are special cases they aren’t the only ones we can imagine. n may be any number, positive or negative. It could be zero, too, but in that case the potential is a flat line and there’s nothing happening there. That’s known as a “free particle”. It’s just something that moves around with no impetus to speed up or slow down or change direction or anything. So let me sketch the potentials for positive n, first for a positive C and second for a negative C. Don’t worry about the numbers on either the x- or the y-axes here; they don’t matter. The shape is all we care about right now. Figure 2. V(r) = C rn for a positive C and a positive n.
Figure 3. V(r) = C rn for a negative C and a positive n.
Now let me sketch the potentials for a negative n, first for a positive C and second for a negative C.
Figure 4. V(r) = C rn for a positive C and a negative n.
Figure 5. V(r) = C rn for a negative C and a negative n.
And now we can look for equilibriums, for circular orbits. If we have a positive n and a positive C, then — well, do the marble-in-a-bowl test. Start from anywhere; the marble rolls down to the origin where it smashes and stops. The only circular orbit is at a radius r of zero. With a positive n and a negative C, start from anywhere except a radius r of exactly zero and the marble rolls off to the right, without ever stopping. The only circular orbit is at a radius r of zero. With a negative n and a positive C, the marble slides down a hill that gets more shallow but that never levels out. It rolls off getting ever farther from the origin. There’s no circular orbits. With a negative n and a negative C, start from anywhere and the marble rolls off to the left. The marble will plummet down that ever-steeper hill. The only circular orbit is at a radius r of zero. So for all these cases, with a potential V(r) = C rn, the only possible “orbits” have both particles zero distance apart. Otherwise the orbiting particle smashes right down into the center or races away never to be seen again. Clearly something has gone wrong with this little project. If you’ve spotted what’s gone wrong please don’t say what it is right away. I’d like people to ponder it a little before coming back to this next week. That will come, I expect, shortly after the first Theorem Thursday post. If you have any requests for that project, please get them in, the sooner the better. My recent talking about central forces got me going. There’s interesting stuff about what central forces allow things to orbit one another, and what forces allow for closed orbits. And I feel like trying out a bit of real mathematics, the kind that physics majors do as undergraduates, around here. I should get something for the student loans I’m still paying off and I’ll accept “showing off on my meager little blog here” as something. Central forces are, uh, forces. Pairs of particles attract each other. The strength of the attraction depends on how far apart they are. The direction of the attraction is exactly towards the other in the pair. So it works like gravity or electric attraction. It might follow a different rule, although I know I’m going to casually refer to things as “gravity” or “gravitational” because that’s just too familiar a reference. I’m formally talking about a problem in classical mechanics, but the ideas and approaches come from orbital mechanics. The language of orbital mechanics comes along with it. And it is too possible that the force would point some other way. Electric charges in a magnetic field feel a force perpendicular to the magnet. And we can represent vortices, things that swirl around the way cyclones do, as particles pushing each other in perpendicular directions. We’re not going to deal with those. The easiest kind of orbit to find is a circular one, made by a single pair of particles. I so want to describe that, but if I do, I’m just going to make things more confusing. It’s an orbit that’s a circle. And we’re sticking to a single pair of particles because it turns out it’s easy to describe the central-force movement of two particles. And it’s kind of impossible to describe the central-force movement three particles. So, let’s stick to two. When we start thinking about what we need to describe the system it’s easy to despair. We need the x, y, and z coordinates for two particles. Plus there’s the mass of both particles. Plus there’s some gravitational constant, however strong the force itself is. That’s at least nine things to keep track of. We don’t need all that. Physics helps us. Ever hear of the Conservation of Angular Momentum? It’s that thing that makes an ice skater twirling around speed up by pulling in his arms and slow down by reaching them out again. In an argument I’m not dealing with here, the Conservation of Angular Momentum tells us the two particles are going to keep to a single plane. They can move together or apart, but they’ll trace out paths in a two-dimensional slice of space. We can, without loss of generality, suppose it to be the horizontal plane. That is, that the z-coordinate for both planets starts as zero and stays there. So we’re down to seven things to keep track of. We can simplify some other stuff. For example, suppose we have one really big mass and one really small one: a sun and a planet, or a planet and a satellite. The sun isn’t going to move very much; the planet hasn’t got enough gravity to matter. We can pretend the sun doesn’t move. We’ll make a little error, but it’ll be small enough we don’t have to care. So we’re down to five things to keep track of. And we’ll do better. The strength of the attractive force isn’t going to change because we don’t need a universe that complicated. The mass of the sun and the planet? Well, that could change, if we wanted to work out how rockets behave. We don’t. So their masses are not going to change. So that’s three things whose value we might not have, but which aren’t going to change. We’ll give those numbers labels that will be letters, but there’s nothing to keep track of. They don’t change. We only have to worry about the x- and y-coordinates of the planet. But we don’t even have to do that, not really. The force between the sun and the planet depends on how far apart they are. This almost begs us to use polar coordinates instead of Cartesian coordinates. In polar coordinates we identify a point by two things. First is how far it is from the origin. Second is what angle the line from the origin to that point makes with some reference line. And if we’re looking for a circular orbit, then we don’t care what the angle is. It’s going to start at some arbitrary value and increase (or decrease) steadily in time. We don’t have to keep track of it. The only thing that changes that we have to keep track of is the distance between the sun and the planet. Since this is a distance, we naturally call this ‘r’. Well, it’s the radius of the circle traced out by the planet. That’s why it makes sense. When I pick this up again I mean to introduce all the kinds of central forces that we might possibly look at. And then how right away we can see there’s no such thing as an orbit. Should be fun.